It's time to get REAL. It's time for me to get back on the saddle and do what my heart set out to do when I started this blog 5 years ago. I feel many are being misled by companies, gluten-free blogs/websites and social media. Being deceived by those wanting to hop on the gluten-free bandwagon and selling out to boost their bank accounts. When I started this blog, it happened to be around the same time that the "gluten-free BOOM" was about to take off. Gluten-free products slowly started appearing on grocery store shelves and I was so excited for gluten-free bread!! 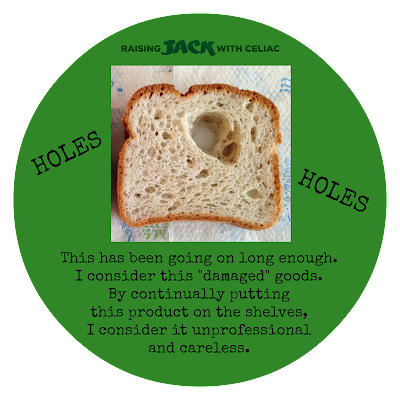 BUT, 6 years later, that same brand still has "holes" in their loaves of bread, which shows me, that this company doesn't care about the quality of their products or ripping off the consumers. I'm surprised to see other celiac/gluten-free bloggers promoting Cheerios...again, I'll be writing about this in my upcoming blog post. I've written over 170 blog posts here on Raising Jack and in the past couple of years, I've gotten wrapped up in the gluten-free craziness and kinda lost my focus. 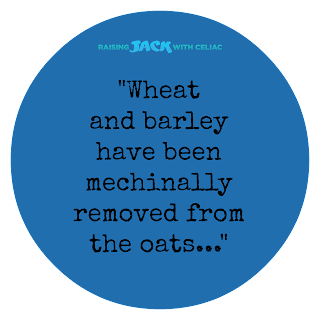 Raising Jack with Celiac was started in hopes to help others, as I personally felt there was a need for a blog/website for families. I wanted to share our everyday life of living with celiac disease, tips on how we deal with certain situations at school, holidays and other social events, celiac disease testing, genetic testing, gluten-free recipes, GF products that we like and giveaways. With all that said, I'm making a promise today. I will only work with companies that produce gluten-free products in dedicated gluten-free facilities or where their products are labeled gluten-free "certified" and they truly care about those living gluten-free. I will only use products in my giveaways that are manufactured in dedicated gluten-free facilities or are gluten-free "certified". 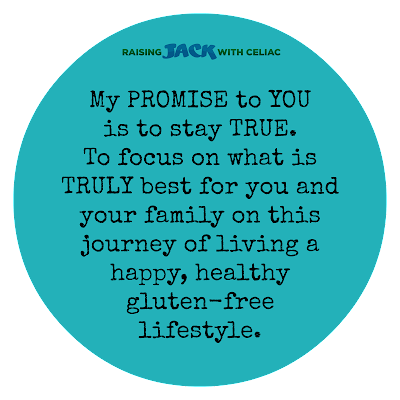 I will continue to be an advocate for those living with celiac disease and teach others about this autoimmune disease that many, many mistaken for the "gluten-free" diet trend. I promise to no longer support gluten-free brands that do not make quality gluten-free products. That gluten-free bread with holes, I'm no longer buying. 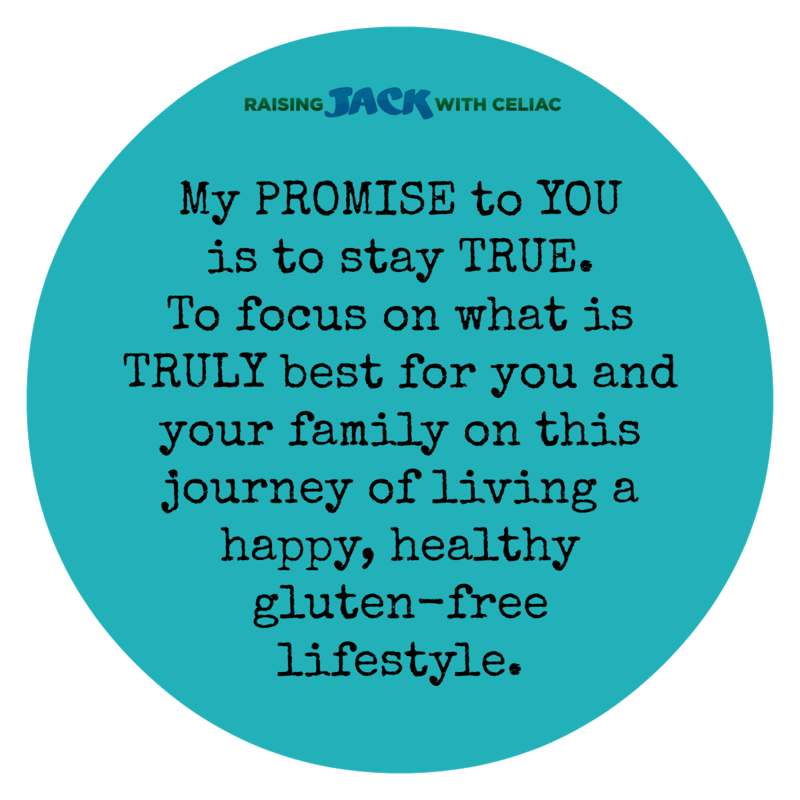 I look forward to writing and investing more time on Raising Jack with Celiac in 2016! Here's to staying TRUE to YOU and most importantly, to the whole reason this blog exists, my son, Jack.